Wow, you guys have blown me away with your emails, Facebook comments, and other messages! 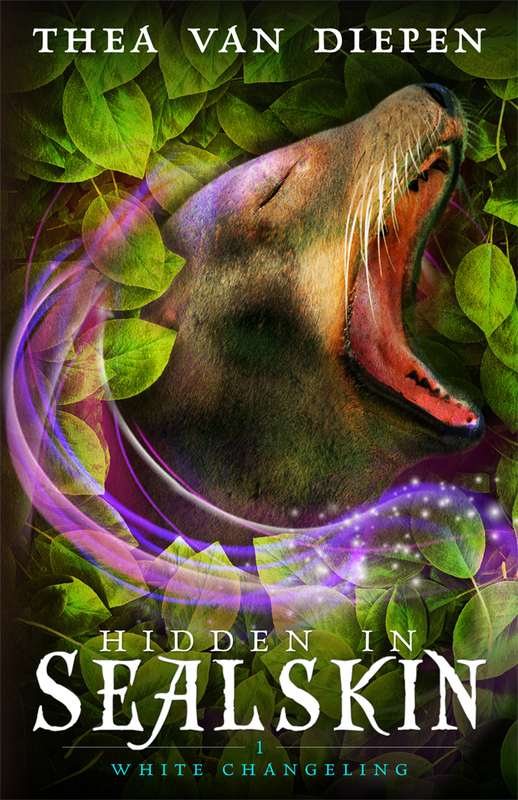 It’s easy to get so lost in the details of creation, and all your comments on the cover and your excitement for Hidden in Sealskin made my day yesterday. In case you missed the last post, these are the three words that sum up what Hidden in Sealskin is all about: fun, mysterious, magical (in the “I don’t know if this is going to help me or hurt me, but it’s cool as heck” sense of magical). It will take you on a journey with Adren, an outlaw also known as the White Changeling as she sets out to steal a sealskin (with the questionable help of Nadin, an awkward teenager she’s not sure she can trust) in order to get a cure for an insane unicorn. The unicorn tensed, about to charge. Adren leapt forward. She grabbed it by the neck, doing all she could to remain stoic. The boy’s eyes narrowed as he raised his knife. Despite herself, Adren’s throat closed. “Put that away!” she yelled at the boy, keeping her grip on the unicorn tight. It strained to be free, but had not yet lost itself enough to ignore her. The boy stared. “Put it away, or I won’t be able to keep the unicorn back!” Adren smoothed her emotions again and pressed against the unicorn. She hoped her calm would transfer and pacify the creature before it could act. With a frown, the boy put away his knife. He took a step back and held up his hands. The unicorn shook, bewildered. Its desire to kill rang through their connection, hot as a bright coal and taut as a bowstring. Adren pressed her head into its neck and stroked it. “Don’t hurt him,” she whispered, her voice steady and gentle. She began to hum. The melody was sweet and simple, and it always worked to soothe the unicorn. Adren regretted that the boy could hear, but there was nothing to be done. The unicorn relaxed as it loosened its grip on rage—loosened, loosened, loosened, and let go. Both of its ears flicked towards her as it recognized the song. When it was more at peace, Adren also let go with a caress and stood as tall as she could next to it, one hand on its shoulder. “It lets you touch it?” The boy gaped. “How did you get here?” The fact that he could both see through her invisibility and use magic hinted at an explanation, but Adren couldn’t yet be sure. “Like a hunter would?” Because paved roads and mossy ground were so terribly prone to showing off footprints. Self-published books aren’t known for their quality. So many of us are so busy that we don’t want to add another book to the to-read pile. Taking a chance with a new author is, well, risky. The quality of my books is one of my highest priorities, which is why I sought the help of knowledgeable beta readers at every stage and hired both a cover designer and an editor with proven track records. Roberto Calas, whose work can be seen on the covers of Stant Litore’s Ansible series, designed beautiful clothing for Hidden in Sealskin and E.J. Clark of Silver Jay Media, recommended by Holly Lisle, took care to make sure my words were well-crafted. Reading is a beautiful way to relax. The fact that we’re busy doesn’t mean that we don’t have time to read, but rather that the best medicine for our condition is to sit down with some tea and a good book. Books help us get out of where we are right now for a time, leaving us refreshed and inspired when we return to our daily lives. And the best part? Books are like cake. Even if you can only have a bite at a time, you still get to eat cake. Of course, if you’re worried about whether you’ll enjoy my work, that’s the easiest part: I have a whole page dedicated to whether you’ll like my books, a section on my blog reserved for the stories and poetry I share online, and the bonuses available to subscribers to my email list. I make sure it’s easy (and quick!) for you to find out if what I write is what you like. In the next post, I’ll be sharing some of my editor’s and beta readers’ favourite lines from Hidden in Sealskin, a sneak peek at the series it’s starting off, and something cool I have for you come release day. Further up and further in! Let me know in the comments what you’re most looking forward to about Hidden in Sealskin!